Lena Ghannam, our storyteller featured in Episode #31, describes her First Kiss and the new type of connection she felt with another human being. This connection is rudely and abruptly severed, just like her hair, when her family finds out about it. This reminded me of my (and many other young Palestinian Americans’) relationship with Palestine. Having visited (and experienced my first kiss with) Palestine more than 15 years ago, I was in love and obsessed with her. I wanted to be present with her and her experience again and again. Sadly, there has been a great deal of distance and separation with Palestine, as I haven’t been back in over 10 years. The conditions of our separation are not ideal, and I am constantly longing to go back to that initial “honeymoon” phase filled with novelty and discovery. Just as young Lena longs for a return to the cruise ship and her long hair. In similar ways, Basel Zayed and Ayn Trio’s music hearkens to foster human connection through music. As Basel Zayed explained to me, the Ayn Trio’s music aims to unite listeners from both Western and Mediterranean backgrounds through familiar instruments and sounds put together in new ways. Through the common understanding of music and musical style, listeners are united and assimilated into ONE audience with a diverse set of experiences and connections to the music. We all long for human connection in one way or another, whether it’s conversations happening around the water cooler at work, the hugs and kisses of loved ones after a long day, or listening to Palestinians Podcast to find connection to one’s dispersed community. As Palestinians, we also have a connection to Palestine, and like Lena’s hair, that connection was severed and disrupted by powers with power and control. Like Lena’s hair, we must learn to find new ways to grow and thrive in difficult circumstances. You can find Basel Zayed and Ayn Trio’s music on Amazon and iTunes! We'd like to thank our summer interns who helped us with audio transcription, podcast production, and social media marketing. It makes us at Palestinians Podcast hopeful for the future when we see young Palestinians with passion, knowledge, and drive. The work these interns did this summer will set the foundation for future episodes of Palestinians Podcast. Zein is a recent graduate from New York University, where her academic focus was on studying identity in the Palestinian diaspora, with a focus on the communities in Berlin and New York. Herself a Palestinian in diaspora, she understands and appreciates the importance of giving a voice to the Palestinian population, and allowing a platform upon which their stories can be shared. Rashad is a rising senior at Oberlin College studying film, Middle East studies, and political science. Much of his artistic work has explored identity formation in the Palestinian diaspora. Serving as an audio intern for the Palestinians Podcast allows him to continue work in Palestinian art and generate a wider audience for Palestinian stories in the United States. Rashad hopes to further this effort through his professional goal of working in Palestinian film production. Thank you Zein and Rashad for your efforts with Palestinians Podcast this summer! We know we can't collect all the fantastic stories that Palestinians have to share - so we need your help! We'd love for you to join our summer storytelling competition. Interview a Palestinian in your life, create a mini-podcast episode, and enter it for a chance to be featured on Palestinians Podcast and win a prize pack! 1. Find a Palestinian person to interview OR Develop your own story about being Palestinian. 2. Sit down, have a conversation, and record it (audio only)! a. Ask questions like: What was your childhood like? Where did you grow up? Where is home to you? What does it mean to be Palestinian? What does Palestine mean to you? Was there a time you felt truly Palestinian? 3. Edit that conversation (if needed) by adding in an intro, conclusion, and music (if you'd like). In your intro make sure you introduce yourself with your name, where you're from, and mention that you are entering the summer storytelling contest on Palestinians Podcast. In your conclusion, make sure to thank the person you interviewed, credit any music you used, and also let us know why you listen to Palestinians Podcast. 4. Submit your interview for a chance to be featured on Palestinians Podcast! Young Storytellers (9-13 years old) can submit stories up to 5 minutes long. Coming of Age Storytellers (14-17) can submit stories up to 10 minutes long. Adult Storytellers (18+) can submit stories up to 15 minutes long. 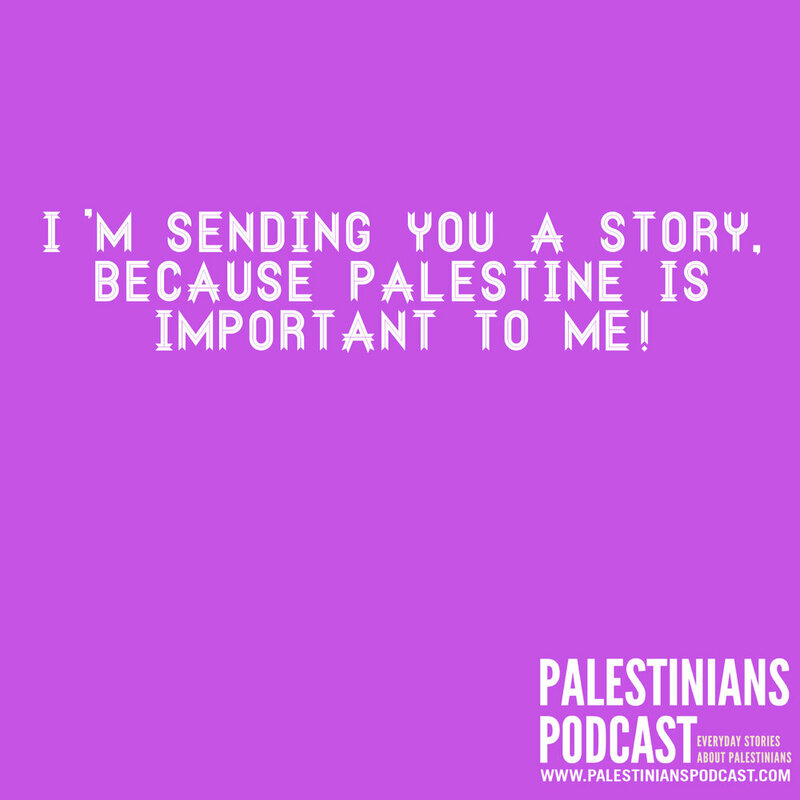 To be eligible to be featured on Palestinians Podcast stories must be submitted by August 29th. Stories can be submitted HERE. 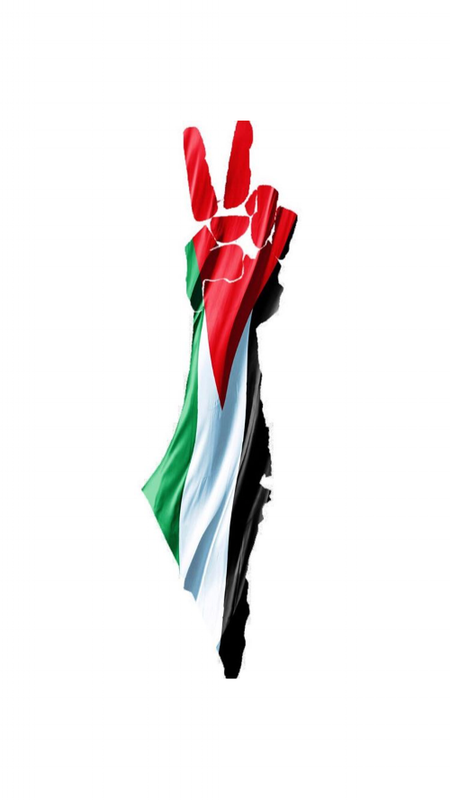 If you have any questions or concerns, feel free to reach out: stories@palestinianspodcast.com! We commemorate the 70th anniversary of the Nakba (the Catastrophe) on May 15th. That's 70 years of Israeli occupation. 70 years of Palestinians being second class (and sometimes third class) citizens. 70 years of Palestinians being displaced from their homes, land, and farms. 70 years of humiliation. 70 years of resistance. And what's our contribution to this commemoration? TWO new episodes featuring dynamic women with stories of resilience, love, and persistence. It's not much - especially considering the 70 years of occupation that Palestinians in Palestine have endured, but it's our small way of pointing our attention to something that all Palestinians think about on a daily basis - exile, occupation, and displacement. When thinking about the past 70 years, one of the first things that comes to mind is the number of generations that have been impacted by the Nakba. Those that were children during the first, second, or current Intifadas are forever impacted by the conflict. In our first episode for this month, Nijmeh discusses her experience as a young child and teenager in occupied Palestine. She discusses the difficulties associated with taking her high school exit exams (tawjihi) and her desire to leave Palestine to pursue her medical studies. She also discusses the long term mental health consequences of growing up in a war zone. Now, as Nijmeh thinks about raising her two daughters in the United States, she's faced with questions about how to introduce them to information on Palestine, on the occupation, and how to ensure they know about that part of their identity. This episode is filled difficult and complex memories that Nijmeh tries to untangle for us. Another thing that comes to mind when thinking about the last 70 years of occupation is the amazing amount of music and cultural resistance that has come from young people in and outside of Palestine. This episode features music from Huda Asfour's upcoming album Kouni. This album, to be released on May 18th, is a testament to Huda's multi-faceted musical influences, identity, and life experiences. While we only share parts of her track "Under the Jasmine" we also plan to feature another track on our next episode (to be released on Mother's Day). Huda is a force to be reckoned with as a Palestinian woman musician and engineer. Her passion for Palestine and music is evident in her album. We got a sneak peak, and we couldn't be more thrilled to feature some of her music on the podcast this month. We're so proud of her work and we're thrilled to support Palestinian artists and musicians. So what will the next 70 years bring? Only time will tell. What we do know is that we will continue to tell our stories. We will continue to produce music and art that represents our rich history and culture. We will continue to educate young Palestinians about their history and their heritage. We will continue to resist by existing. May we always remember and may we always resist. How do you create creative material during periods of conflict? This is a question I've been asking myself quite a bit lately. There's been quite a bit distracting us from creating and producing here at Palestinians Podcast. Between all the harrowing news coming out of Gaza, the violence in United States' schools and public places, and general life chaos, it's been hard to get the work done. That's why you'll notice we're a bit behind on releasing episodes. But it's through conversations with our guests that we gain motivation and strength. Our episode with Tariq Luthun is an example of one of those motivating and exhilarating conversations. Tariq is a fantastic poet and spoken word performer who manages to produce creative work despite a busy work and life schedule. His dedication to his craft and his ability to get his creative work done is admirable. He performs across the country and is invited to do so by groups and other organizations who recognize his talent. We can't wait to see where Tariq's creative work takes him. We are grateful for his time! Also featured in this week's episode is the Typo Band (Khata'a Mattbaie), a band from Gaza city. Their ability to perform and create music, despite living in the largest open air prison in the world is beyond anything we could ever imagine. We're obsessed with their song Ehlam Bl Nour! You can check out their music and find more information about them on their Facebook and Instagram sites. We also had our first ever live episode on Facebook and Instagram live on April 15th with Yasmeen Mjalli of Baby Fist. Despite being born and raised in the United States, Yasmeen and her family moved to Palestine where she established her clothing business which aims to raise awareness to the sexual harassment that takes place on the streets in Palestine and throughout the Arab world. During our interview, Yasmeen discussed the importance of not waiting until conflict is over to address social issues in society. You can watch out episode here. So how do you create during periods of conflict? It seems that the best way is to just keep going, to keep trekking, to keep creating. Because, as Tariq states in this month's episode, we should always be telling our stories and fighting against the powers that are aiming to erase our history and our existence. By telling stories during conflict, we say: "we are here and will remain here!" Do you have strategies for how you continue creating creatively during times of distress and conflict? Comment below if so, we'd love to hear from you! We hope you'll continue to support the podcast by telling others about it, writing a review on iTunes, and spreading the word through social media. We are so thankful to have supportive listeners. Thank you for listening! I've struggled with releasing a "Black History Month" specific episode. I've asked myself questions like: "Is it Palestinians Podcast's place to speak about Black History Month?" or "Does it make sense for a podcast about Palestinians to focus on Black History Month?" or "Will an episode on our podcast be a genuine contribution to such an important topic?" These issues of voice, tokenism, and representation are elements of the podcast I am always wary of as a producer. Ultimately, I decided to release Ahmad Abuznaid's story during Black History Month. Ahmad is not a black man, Ahmad is a Palestinian man. But Ahmad's lived experiences in the United States have put him in a unique position to advocate for rights and equality for Black Americans (and other traditionally disadvantaged Americans like LGBTQ, undocumented, and Native individuals). 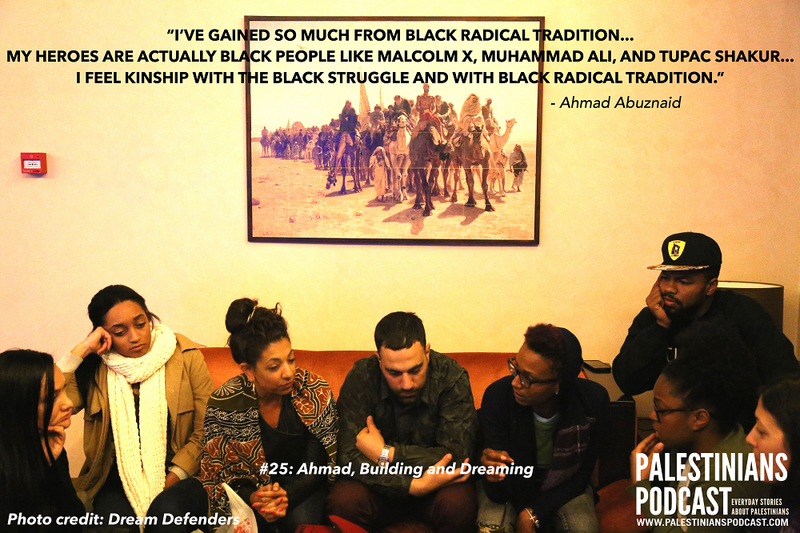 His role in a historically Black fraternity and his founding of Dream Defenders make Ahmad a Palestinian representative who is actively involved in freedom fighting movements around the globe. Dream Defenders recently released a statement highlighting their support of movements aiming to free child prisoners around the world, including Ahed Tamimi in Palestine. Their statement included from Black activists, actors, and other public figures including Danny Glover, Rosario Dawson, Alice Walker, Angela Davis, and many more. We commend Dream Defenders on bringing together freedom fighting movements from across the globe to advocate for the rights of the marginalized. We also decided to incorporate Palestinian hip-hop music throughout the episode. The hip-hop scene in Palestine has been growing and has been highly influenced by Black American artists. This music featured, by Project Chaos, aims to "to influence and develop the culture of the young generation in Palestine to make them able to participate and interact efficiently in local societies." Project Chaos using hip hop and music production as tools to help improve the talent and skills of young Palestinians to generate passion, team building, and drive. So is this episode an ode to Black History Month? Likely not. But this episode emphasizes the great influence that Black history has had on the Palestinian freedom fighting movement, on culture, and on freedom fighting movements across the globe. It's a small contribution, but it's Ahmad's unique story that brings us closer to the cause. We dedicate this episode to those fighting for freedom in any form across the world, including Ahed Tamimi. Say "I Love You!" with a Palestine Valentine from Palestinians Podcast! We've put together a few cool graphics that not only wish your friends and family a Happy Valentine's Day but also let them know about your love for Palestine. 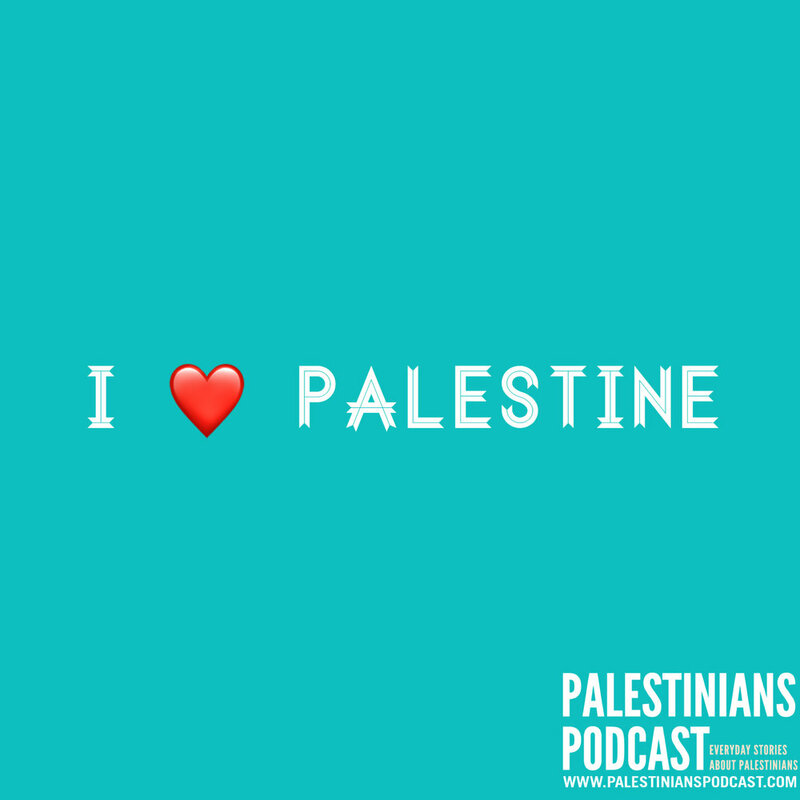 There's no better way to celebrate a day of love than by spreading the word about Palestine and Palestinians Podcast! Send your friends a Palestine Valentine along with your favorite episode of Palestinians Podcast! Make sure to let them know that you listen and enjoy the podcast! You can find all FIVE valentine designs on Facebook, Instagram, and Twitter! You can also download the high-resolution images here as well. Salma's story highlights the solidarity of indigenous people to the Palestinian cause. Salma challenges us to think about whether or not we stand with other causes and groups yearning for freedom and peace around the world, including here in the United States. Now more than ever our attention is called to many different movements on social media, and it's important to remember as Palestinians that we are called to freedom movements and to support movements like ours. Which movements are you called to support? Which do you feel obligated to? Perhaps at the start of this new year, we can do an inventory of all the movements we support. We are inspired by Salma's example and the example of all indigenous people who continue to fight for freedom and justice everywhere. When the President of the United States declared that Jerusalem was Israel's recognized capital I felt as if my world was shaken. I don't live in Palestine, I wasn't born in Palestine. I was born and raised in the United States. Yet I still felt lost, confused, and sad. This is something I discuss in the latest episode of Palestinians Podcast (#23: Nadia, Not on the Map). This feeling like I don't have ownership or agency over these feelings of sadness and depression because I'm a member of the Palestinian diaspora. And yet, I can tell many stories about my experiences of being denied my identity, my history, and my heritage. So how is it that I reconcile these feelings of belonging and not belonging. Feelings of being "too west for the east and too east for the west." Feelings of being torn between two places while having your feet planted firmly in one. I do this through storytelling. I do this through the recounting of stories and experiences that have happened to me in the past and that continue to haunt or inspire me to this day. By going back in my memory and re-living painful (or happy) memories, I am able to process them, to find my place in the stories, and understand my feelings and emotions to the events happening around me. In this episode I tell a story that some might find silly. A story that is shrouded in a costume of light-hearted laughter and slapstick injury - but the story means a great deal to me. This is a story about the moment I realized that being from Palestine wasn't like being from China or Italy or the Netherlands. That being Palestinian was it's own entity that wasn't always understood by those around me. I've gone back and forth about whether or not to release this episode. Whether or not to include the political and social commentary I had written as opening and closing statements for my story. About whether it would alienate listeners or make them feel unwelcome or unappreciated. But those comments are also a part of my story and who I am. For me, and most Palestinians, our personal everyday lives are inherently political (even when we don't want them to be). I hope the episode inspires you to think about your own stories and your own history. I hope the episode inspires you to find your voice and your place in this scary world we live in. We all need to tell our stories. We need to take back the Palestinian narrative. We need to re-write the erased and forgotten history of Palestine and it's diaspora. We at Palestinians Podcast are committed to continue telling stories of, for, about, and from Palestinians. We are committed to being a part of the narrative and public discourse. Thank you for listening and spreading the world. May the New Year bring you and yours peace, joy, and love. I didn’t grow up embroidering or knowing how to do any Palestinian handiwork. I only really started to appreciate Palestinian tatreez when I was older and understood it’s importance. The stitches weave the present and the past together. It is tradition, it is culture, and it is politics all summed up into fabric. 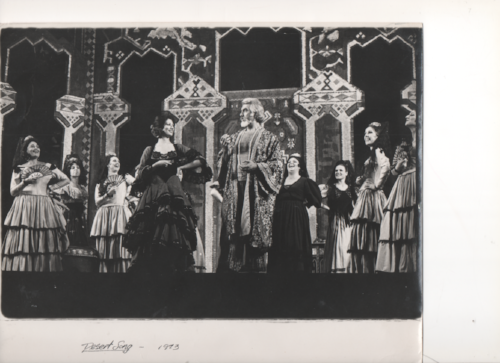 It is primarily a women’s craft, the women’s voice and story looping through history, conflict, and war. After walking into the lobby, the exhibit stood prominently and proudly on the left hand side. 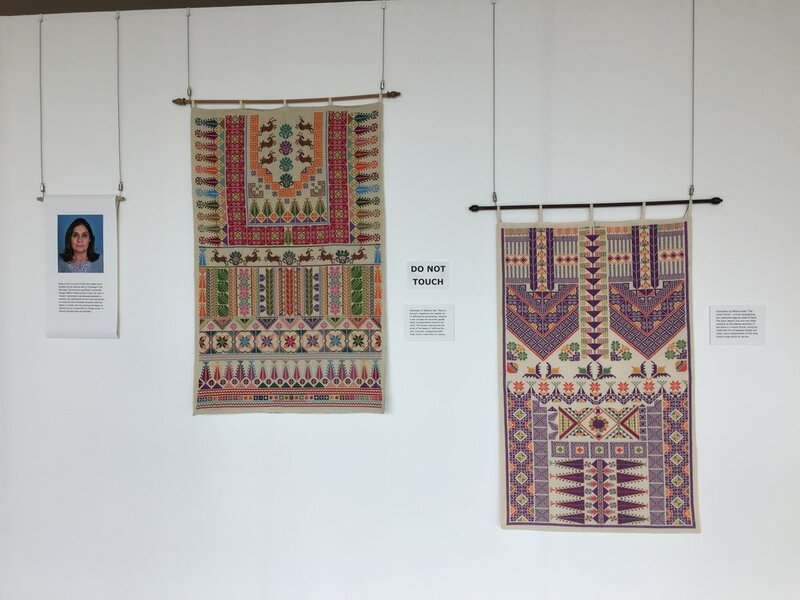 I was so excited and thrilled to see the rows of artwork, embroidery, and pictures illustrating and highlighting the history of embroidery in Palestine and the influence tatreez has had on fashion, art, and politics. Since the exhibit has ended, the pictures below aim to show you some of the work that was on display, in case you were not able to see it in person. I felt empowered by this exhibit. I felt empowered when I walked in and saw “Palestinian” written prominently in the lobby of the United Nations General Assembly. I thought “that’s me!” Those are my people. We are more than victims, we are more than people fighting for their homes and their land. We are more than just political pawns in a larger and seemingly never ending war. We are a people with history, culture, and tradition that has survived centuries. 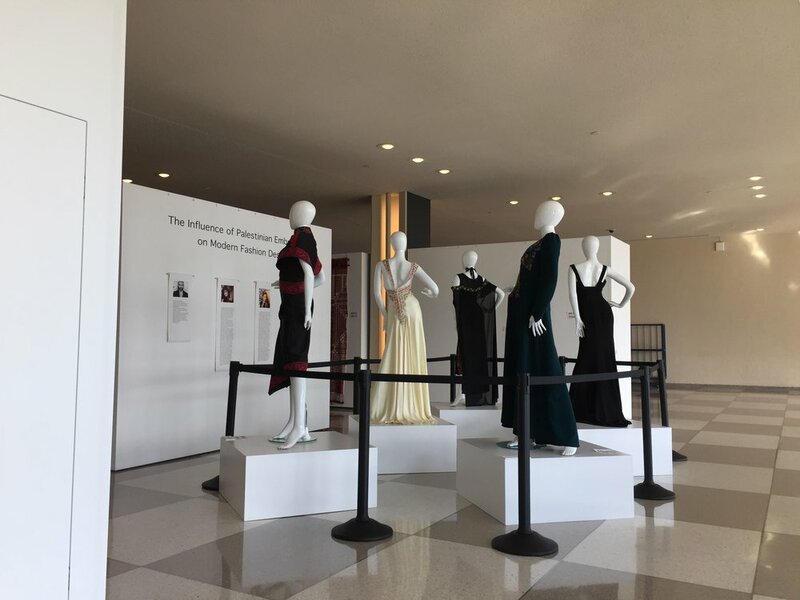 So, yeah, maybe it was just an exhibit in the lobby of the United Nations General Assembly in New York that only a few hundred or thousand people saw. But for me, it was a symbol of something more, of tides changing, of recognition which may, someday, turn into rights, freedom, and undeterred existence. Meeting Zena Agha was a complete coincidence. A few weeks before the 2015 Palestinians, Live! event in Boston, I received a Facebook message from one of Zena’s friends asking me if there was an opportunity for Zena to tell her story. At that point in time, I had a full line up of storytellers, so I couldn’t offer Zena a storytelling slot. I spent some time watching YouTube videos of Zena’s previous poetry performances and talks and was mesmerized. I messaged Zena and asked if she would be willing to perform a poem at the event. I will never regret that decision. Zena closed the show with her performance of her poem “Palestine” (which you can actually hear in #12: Zena). Her performance really helped me understand the power of poetry and the amazing grace that Zena is able to relay on stage. Since the performance we’ve been in close contact and I consider her to be a wonderful friend. Zena’s episode is eclectic. It contains audio from many different settings, places, and times. I think this represents the transcendence of Zena’s message and poetry. Her poetry can impact people in so many different ways, from so many different backgrounds, and in so many different locations. Zena’s poetry (and performances) remind the listener of the complexity of the Palestinian, immigrant, and refugee experience. Although she claims to write most of the poems she performs in 5-10 minutes after important events or moments in her life, Zena’s poetry has been translated into multiple languages and analyzed by scholars and students in multiple settings. Her poetry has transcended its original purpose and scope. I am very grateful for the chance and the opportunity to know Zena on a personal level. She has taught me a great deal about balance in life, importance of internal reflection, and the precision of language. As a young woman with a passion for Palestine, poetry, and her mum (as she calls her), I think we can learn a great deal about living through her poetry and her work. She is definitely a woman to watch for as she finished her scholarly work. We are proud of Zena. Palestine is proud of Zena. Zena makes poetry proud. Wafa Ghnaim is one of the sweetest people I have every met. She recently authored a book called Tatreez and Tea. It’s an amazing collection of Palestinian embroidery patterns and tea recipes that she’s been collecting since she was a young child when she started to learn the craft from her mother. The book helps readers better understand Wafa’s experience as a child born to immigrants in the United States, and the struggle for identity and home that many Palestinians in the diaspora face. In today’s world “immigrant” has become a negative term and mass migration from countries that are worn-torn to countries that provide a bit more stability has become common place. In her emotionally raw episode, Wafa discusses the difficulties of being a child of immigrants in the 1980’s in Boston. Her experience with bullying and physical violence have had a toll on her life ever since. Her story gives us context and understanding for the immigrant story in the United States today and helps us better understand the struggle that many endure in countries around the world. As Palestinians in the diaspora, we are always searching for home and identity. This has been mentioned again and again by stories featured on Palestinians Podcast (#1: Annalise, #2: Rana, #7: Nadia). Something that Wafa does profoundly in trying to better understand herself and her identity, is articulate the importance Palestinian diaspora to the Palestinian cause. 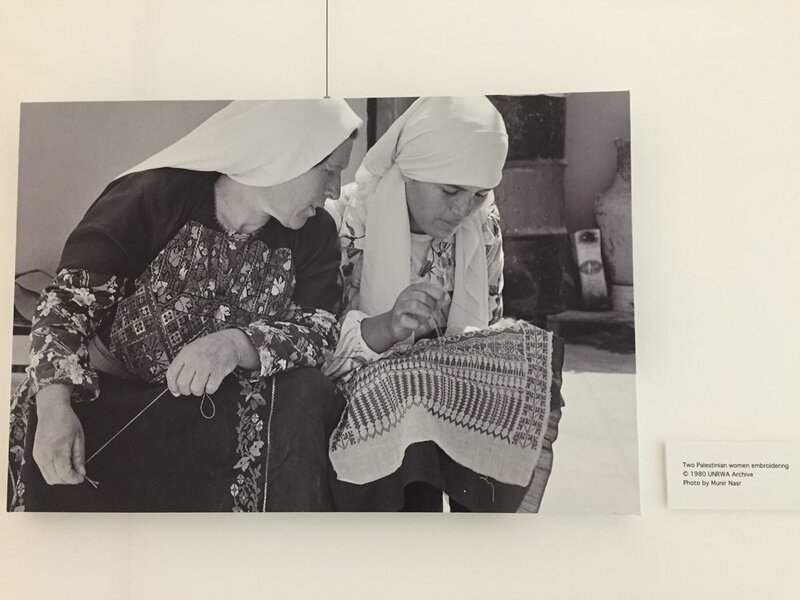 Wafa uses the imagery of her favorite thobe (or traditionally embroidered Palestinian dress) design, the Gardens design, to describe the diaspora’s relationship to Palestine. While Palestine remains the root and the base of identity for so many people living in the diaspora, it is hard for many to imagine themselves as part of the traditional Palestinian family tree. Instead, Wafa discusses the potential for those in the diaspora to be a part of the Palestinian garden. The tree stands strong in Palestine, but the offshoots bloom on their own in the diaspora, developing into flowers that continue the traditions of the homeland. It is that homeland that Wafa and her husband hope to bring to their child. Children of Palestinians inherit the struggle of identity and displacement, whether they recognize it or not. We’ve seen in many episodes of Palestinians Podcast that those of us not born in Palestine yearn for meaning and connection. Wafa has found that connection through her practice of embroidery. You can learn more about Wafa’s book on her website and purchase the digital version of the book on Amazon. Many of us have experienced the exact moment that Jehan Bseiso experienced with the Big Yellow Atlas (if you don’t know what I’m talking about, go listen to Episode 10 of Palestinians Podcast). Her world was turned upside down as a child when her mother had to pencil in her homeland in a big yellow atlas. My moment happened when I wanted to write my 6th grade report on Palestine but was told by my teacher that there was no such place (because it wasn’t on the world map hanging in the classroom) and perhaps I could write about Egypt instead? This moment (often experienced during childhood) is jarring and makes an individual feel incomplete and insufficient. The homes and playgrounds that I imagined my parents inhabited disappeared into thin air in my mind the instant I couldn’t find Palestine on that map. The conversations I had with my parents and the cultural events where I learned to experience Palestine were suddenly undermined in an instance. As Palestinians, we’ve all experienced a moment of realization that is similar to Jehan’s. That moment when you realize you aren’t from a place that everyone recognizes, agrees with, knows about, or is even recognized on a map. Jehan has taken her aversion and dislike of maps and has used it to fuel her fire, to make a difference. Despite never meeting Jehan in person, I know that Jehan is a force to be reckoned with. She has a personality that came through the headphones during our Skype conversation. And how could she not be a strong force? She has dedicated her life and her time to making sure people hear about Palestine and her people. While Jehan is the Head of Communications for Doctors Without Borders in the Middle East Region by day (and some long evenings), she is a poet and artist by night giving voice to many in the diaspora. Besides publishing her poetry in unconventional places (like news websites and policy blogs) Jehan also has published work with two other Gazan poets in a poetry anthology titled “I Remember My Name.” She is also seeking poetry submissions for a collaborative refugee anthology she is helping to put together. The anthology, entitled ‘Making Mirrors’: Righting/Writing by Refugees will be a multilingual and interactive collaborative volume of poems that will be published as a book and an online project. If you have a poem (and/or photography) to contribute, you can contact her at makingmirrorsanthology@gmail.com. Please help support her new project in collaboration with Becky Thompson. Jehan traveled to Palestine as part of the Palestinian Festival of Literature in May 2016. To learn more about and to support PalFest, please visit their website. So why not pick up your pencil/pen/keyboard and start channeling those suppressed emotions into a story or poem. You can contribute to Jehan’s anthology, Palestinians Podcast, or one of our live storytelling events happening in the next few months. While these stifling and jarring events happen, it is best to have a creative and healthy outlet for our emotions and our frustrations. We hope that Jehan has inspired you to consider writing/performing/documenting the moments in your life where you grew as a person and as a Palestinian. 1. You probably have little knowledge of what its like to be a gay Arab man living in the Middle East (unless you’re a gay Arab man). I’m as open minded as the next person and I have one heck of an imagination… But I still don’t feel like I could have understood as much as I do now about the experience of closeted gay men in the Arab world if I hadn’t read Guapa. The intricacies of the novel will make you feel like you are experiencing the stigma, shame, and everyday discrimination that Rasa (the main character) endures on a daily basis. During the three days that it took me to finish the novel, I found myself going through so many emotional twists and turns including fear, shame, and shock. I felt like I was experiencing a small portion of the emotional turmoil that gay men in the Middle East face everyday due to backlash and stigma. It’s this understanding and empathy that I gained by reading Guapa that I think makes it a good investment of time and energy. 2. You’ll learn a lot about your own grandmother and family dynamics in the process. One of the most significant characters in the book is Rasa’s grandmother (Teta). Her discovery of Rasa with his partner in bed starts the novel’s exciting and fast paced 24-hour journey. But the way in which Saleem describes Rasa’s grandmother’s characteristics, nuances, and intricacies made me constantly think of my grandmother and her similar behavior. Saleem has really managed to encapsulate so much about the Palestinian Teta in this novel. I could relate to her treatment of Rasa throughout the book and the social cues that she bases her behavior on, despite not dealing with the same issues as Rasa. I learned more about my grandmother after reading Guapa because I came to the understanding that there were many central beliefs, values, and tendencies that all Arab grandmothers feed from. It’s helpful to know that it wasn’t just my grandmother that made me feel like I was doing things wrong in daily life, even if her criticisms always came from a place of love. 3. The novel is as much about politics as it is about social issues. The novel delves deep into political issues that are tied to everyday existence in many countries in the Middle East. Saleem does an excellent job of exploring the complex relationships between politics and social issues. The presence of war, bombings, and terror feature highly in the backdrop of this novel and add to the complexity of being gay in the Arab world. Not only will the novel encourage you to face your own understanding of sexual minority issues, but it will force you to think about the political and violent backdrop of many Arab countries and the ramifications of these environments on the people living in these regions. 4. Supporting Palestinian writers and artists is important. It also encourages young aspiring writers and artists. By supporting writers, poets, and artists that are from Palestine you are giving voice to a population that doesn’t often get heard in the mainstream artistic community. By buying the book or asking for it to be carried at your local library, you are also encouraging others to learn about a topic or region you may not be familiar with. Supporting authors like Saleem helps encourage younger Palestinian writers and artists to be encouraged to continue with their work and pursue their dreams. 5. It’s a really well written, fast paced, and entertaining piece of fiction! And even if you don’t care about the political, social, or cultural ramifications of the novel, you still will be entertained by this awesome piece of fiction. Happy reading! 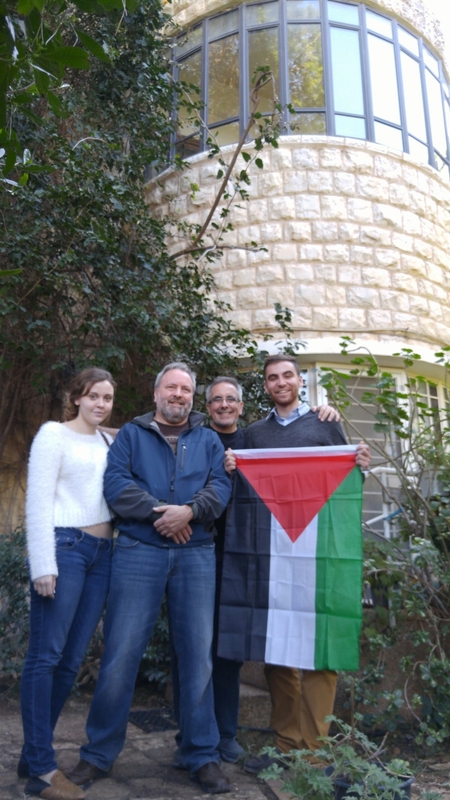 Click here to hear Episode 9 of Palestinians Podcast! Thanks for your support!